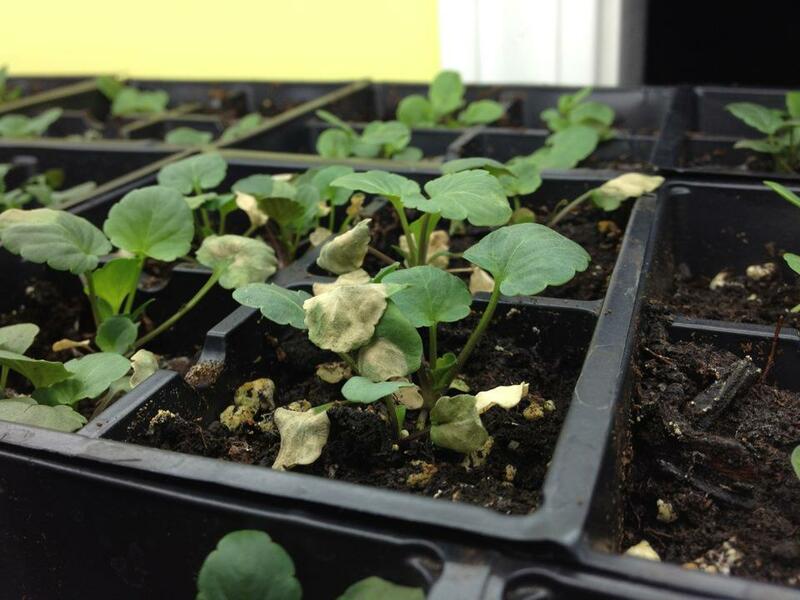 Earlier this week I noticed that the pansy seeds seem to look a little ... sickly. I hopped on Facebook and posted the photo below looking for any advice. Karen from Paul and Sandy's, Too, a local garden center, was quick to reply to my cry for help. She determined from the photo that the soil was too wet, and that the soil mixture I was using might be too heavy. She was right on both accounts. I usually wait and order my seed-starting mix from Gardener's Supply. Instead, before I ordered I got the seed-starting bug, and I bought a bag of Epsoma seed-starting soil to tide me over. When I saw it contained perlite, I had a hunch that it wouldn't be right, but I sowed the seeds anyway. Now I wish I hadn't! It looks like they are drying out but I may lose a few seedlings in the process. What's funny is that I recently read somewhere (either a gardening book or magazine) that the author considered seed-starting annoying because it was baby-sitting problematic children. I remember thinking, it's not that bad! I'm disinfecting older seed starting containers today and I'm hoping to start onion and impatien seeds tonight, along with more geranium seeds. I found these seeds from Swallowtail Garden Seeds. It's surprisingly really difficult to find geranium seeds for sale! For some reason, I'm pretty attached to these plants now. Maybe it's because my grandfather and mom used to grow them every year, and keep them indoors over the winter. I used to keep them in our apartment before we bought a house, where they would take over all the windowsills in our west-facing apartment. Nowadays, window space is tight (we do not have windowsills so there are only a few tables where plants can live, and I try to keep it restricted to true houseplants). We have no basement so I can't overwinter them there, either. I bought a mix of varieties - hoping they will look nice this summer!